A few days ago, I was working with a data set that included a list of companies in Excel along with their logos. I wanted to place the logo of each company in the cell adjacent to its name and lock it in such a way that when I resize the cell, the logo should resize as well. I also wanted the logos to get filtered when I filter the name of the companies. 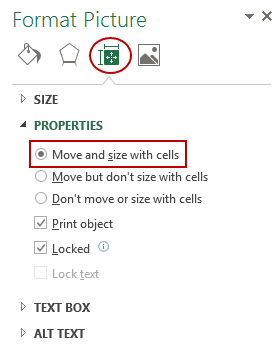 You can easily insert a picture into a cell in Excel in a way that when you move, resize, and/or filter the cell, the picture also moves/resizes/filters. Below is an example where the logos of some popular companies are inserted in the adjacent column, and when the cells are filtered, the logos also get filtered with the cells. This could also be useful if you’re working with products/SKUs and their images. When you insert an image in Excel, it not linked to the cells and would not move, filter, hide, and resize with cells. Insert a Picture Into a Cell in Excel. Lock the Picture in the cell so that it moves, resizes, and filters with the cells. Click on the Pictures option (it’s in the illustrations group). 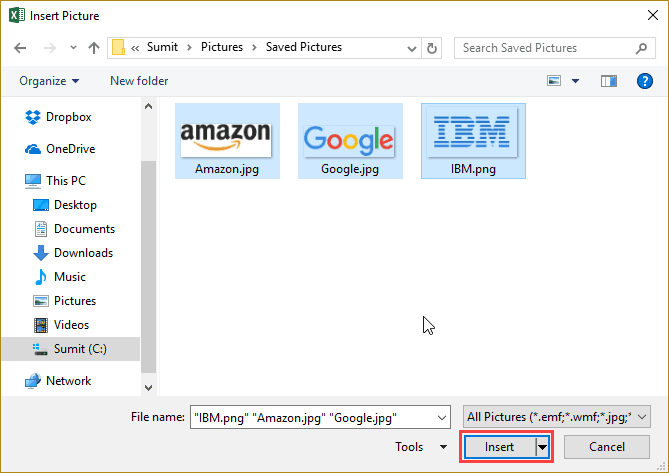 In the ‘Insert Picture’ dialog box, locate the pictures that you want to insert into a cell in Excel. Re-size the picture/image so that it can fit perfectly within the cell. A cool way to do this is to first press the ALT key and then move the picture with the mouse. It will snap and arrange itself with the border of the cell as soon it comes close to it. 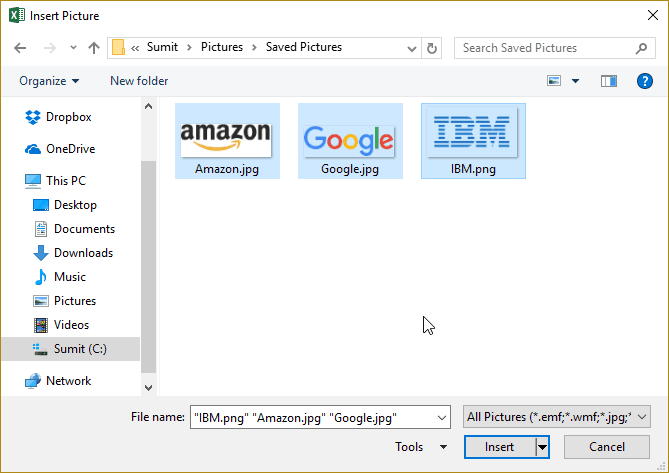 If you have multiple images, you can select and insert all the images at once (as shown in step 4). You can also resize images by selecting it and dragging the edges. In the case of logos or product images, you may want to keep the aspect ratio of the image intact. To keep the aspect ratio intact, use the corners of an image to resize it. When you place an image within a cell using the steps above, it will not stick with the cell in case you resize, filter, or hide the cells. If you want the image to stick to the cell, you need to lock the image to the cell it’s placed n.
To do this, you need to follow the additional steps as shown in the section below. Once you have inserted the image into the workbook, resized it ti fit within a cell, and placed it in the cell, you need to lock it to make sure it moves, filters, and hides with the cell. Right-click on the picture and select Format Picture. In the Format Picture pane, select Size & Properties and with the options in Properties, select ‘Move and size with cells’. Now you can move cells, filter it, or hide it, and the picture will also move/filter/hide. This could be a useful trick when you have a list of products with their images, and you want to filter certain categories of products along with their images. 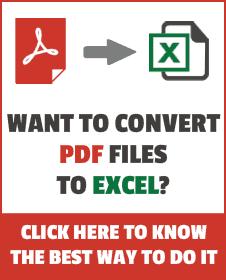 You can also use this trick while creating Excel Dashboards. 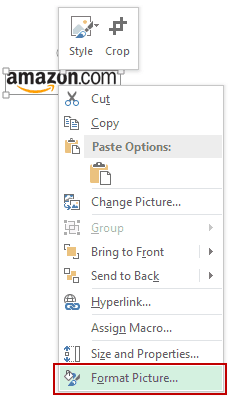 Insert a Picture in a Comment in Excel. Insert Line Break in Excel Formula result. Picture Lookup Technique using Named Ranges. Thank you so much, I know it must been a way for it a long time ago now I decided to search for it. I did all, as mentioned above, but for sure with some differences due to the Excel 2016 Version I use. b. I clicked right mouse and click “Size and properties” and then activated the upper button: “depending from cell position and size”. c. When I try to insert the picture into another cell, e.g. with =$A$1 only a 0 appears. The picture is NOT shown. Thanks in advance for helpful remarks. Ich habe das alles gemacht. In Excel 2016 habe ich die Bilder eingefügt mit dem Einfügen/Bilder Befehl (oberste Menüleiste), dann über rechte Maustaste “Größe und Eigenschaften” gewählt und dann”von Zellposition und Größe abhängig” angeklickt. Wenn ich jetzt z.B. mit =$A§1 das Bild anspreche, erscheint nur eine Null 0, die Zelle ist ja auch leer. Wie kann ich das Bild sichtbar kriegen??? Amazing. Thank you very much for sharing! Thanks Sumit. It was very self-explanatory. Detailed yet to the point. Was looking for something like this since long! Thank you very much… good tutorial & Helpful. Thanks. Knew it was possible, but didn’t remember where to find the settings for it. It almost worked. I have a free add-in for flash cards that picks up on the cell contents to make the flash cards. It does not recognize that the cell with the graphic has contents. I fed this page back to the developer in case he can figure out a way. Hiya could this be useful with a large data set i.e 1500 images? I have an advanced filter macro that utilizes data off a seperate tab where i would like to insert the images, just concerned it will be very slow due to the amount of images and want to find out before trying to insert that many images if it will not work, cheers! I don’t see how this makes it “filterable”, locking the image into the cell was described in this tutorial, but it seems that I missed the filter portion of it. Do you know what the cause of this could be? And how to prevent it? Thanks for sharing Artemy.. Will check it out! Glad you found this helpful! !